Well, I had a wonderfully written post. And our server ate it. I’m trying this again, but there is no way it will match the brilliance I originally wrote. Night 6 of the #8BeersOfChanukah is Fruit Helmet, a collaboration between Bellwoods Brewery (Hafis Rd location) and rogue gypsy brewer, Evil Twin, hailing from Denmark and currently based out of Brooklyn, NY. We spent a lovely autumn afternoon at the Hafis Rd taproom playing Scrabble and drinking sours after wandering around Black Creek Pioneer Village. 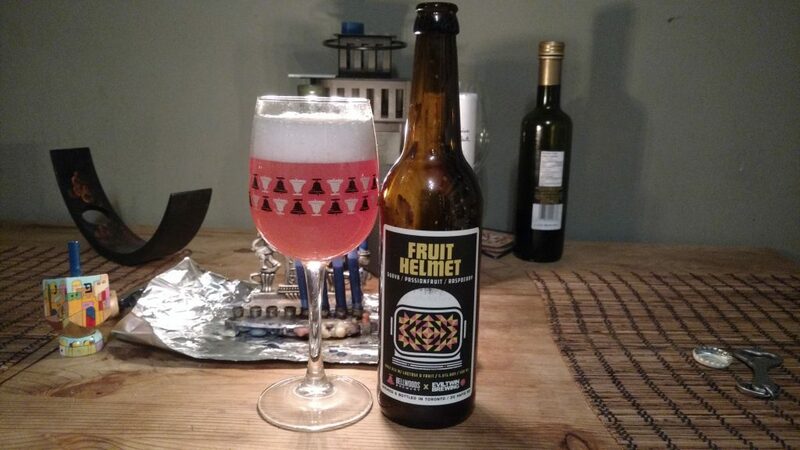 Fruit Helmet is a Pale Ale with lactose, guava, passionfruit, and raspberry, and weighs in at 5.6% ABV in a 500 ml bottle. As always my record keeping is impeccable so I’m not sure how much it cost, but I estimate it to be around $7.95 a bottle. Bellwoods is typically a solid brewery, and this was our first visit to the Hafis Rd location (cause dang, there is very little around there). Beer nerds will know Evil Twin from their association with Brooklyn’s premier beer destination, Tørst. The back room of Tørst used to house a Michelin-star rated restaurant that uniquely focused on food and beer pairings. Sadly, Luksus has ceased operations since our May 2016 visit, but Torontonians had the chance to sample executive chef Daniel Burns‘ creations at this year’s Cask Days festival. I love a good collaboration brew. I like to picture the brewmasters running around in lab coats, cackling like mad scientists as they work. I know, super dorky. Look, it’s my website, I can be as dorky as I want. 6 nights is a long streak for me to be writing about beer and I’ve got 2 more nights to go, so give me a break. This brew is fermented with lactose, so again I didn’t share with Kole. He’s lactose intolerant, and I couldn’t suffer through him consuming it. Appearance: Unfiltered orange colour with lots of pink undertones to the hue from the raspberries. Lasting, thick, frothy white head. Lot of shmutz sediment leftover in the bottle. Aroma: Extremely aromatic. The guava and passionfruit aromas are overpowering and I can smell them without raising my glass for a sniff. Reminds me of a New Zealand-style Sauvignon Blanc without the pyrazines. Grassy from the hops. Taste: Sour, quite tart. Pink grapefruit, citrus pith. Tart raspberry on the finish. Cheese rind from the lactose, with a smooth and creamy mouth feel from the lactose sugar as well. Aftertaste: Guava and passionfruit linger for the aftertaste. Food pairing: Gravlax. I firmly believe smoked fish and sour beers are made for each other. Overall: I regret buying only one bottle, I’d like a lot more. Enjoy it as you hide from Aunt Mildred’s laugh at the family Chanukah party.